Every island is a world of its own. This was one of the first discoveries made soon after settling in Malta five years ago, just a few days after the arrival. I remember how much it surprised me when I heard the Prime Minister (Lawrence Gonzi at that time) addressing his speech to the nation and saying “ghaziz poplu Malti u Għawdxi” (‘dear people of Malta and Gozo’). “Why didn’t he call everyone ‘Maltese’?” – I asked a Maltese sitting nearby. 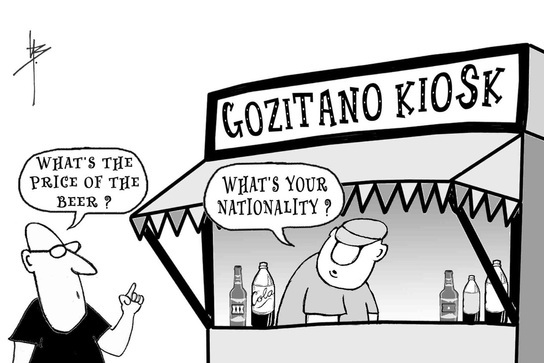 “Is ‘Gozitan’ a separate nation?”. “Because THEY like to think of THEMSELVES as if they were a separate nation”, was the answer. For a moment I imagined how a Greek Prime Minister would mention all islands in his speech to the nation and it seemed just awkward. Gozo is one of the safest places in the whole world. Crime rates in Malta are generally low but Gozo is extra safe. In some villages you might see keys left in keyholes – an unbelievable sight for a foreigner from a big city. However, if you are too indelicate with your ways around, things go wrong and (let’s imagine) one day you discover a bomb underneath your car (METAPHOR! ), then it is very unlikely you will ever find out the sender of the ticket to the better world. Gozitans are a close community so nobody will testify against his/her neighbour. Having such strong back up, Gozitans feel secure not to pay attention to legal matters in general. Gozitans are champions in trying to be good on everyone’s books. One thing all my Gozitan acquaintances have in common is a skill of avoiding direct confrontation. In fact, at times it is difficult to find out what they really think about you. Even if a Gozitan dude dislikes you with passion he would rather stick a bomb under your car (METAPHOR AGAIN!) than telling it in your face. However, do not rush to label them double-faced or accuse in having hidden agendas, there is a very logical explanation for this mentality. Expressing your opinions and taking sides openly might result in making more enemies than friends – not a good strategy when you live on a tiny island with a few people around. There is a number of sayings about Gozo made by Maltese. ‘To leave like a Gozitan’ (to leave without saying good-bye), ‘nobody knows what happens in Gozo behind closed doors’ and ‘dubbien ta’ Għawdex’ (direct translation ‘a fly from Gozo’ and a synonym of ‘an annoying fly’) characterise the islanders in an odd light. However, I am unaware of such sayings from the other shore. Perhaps, fellows of Gozo are not much interested in gossiping about the mainland (a far-away land from that perspective) or it is another side of them being so masterful in avoiding confrontations. Nevertheless, Maltese never miss a chance to spend a tranquil weekend in Gozo, silently admitting their admiration for the island’s wonderful landscapes and peaceful environment. The Gozitan dialect of the Maltese language is a constant source of inspiration for Maltese to joke about their compatriots from the sister island. The difference in pronunciation can be spotted even by a foreigner. However, from a linguistic perspective, this dialect is closer to the proper Maltese language than the official one. The young generation of Gozitans disprove the disdainful jokes about their home island. Often very ambitious, goal-seeking and career-oriented, they aim high and do their best to get there. In terms of architecture, Gozo wins over Malta. Small villages are full of hidden treasures – beautiful stone balconies, unique antique door knockers, untouched old houses and quiet narrow streets. Frankly, I do not think the opinion of many Maltese about Gozitans fits into ‘metropolitan dudes look down on retrograde provinсials’ scheme. The more you pay attention to the image of Gozo portrayed by the mainlanders, the more distinctively you would smell the scent of jealousy. Does it only seem to me that many residing on the main island envy Gozo’s green hills, open spaces and tranquillity? Perhaps in Gozo they see what Malta was in the past and simply cannot forgive their compatriots for their own loss of the traditional charm, sacrificed for a sake of development and modernisation. P.S. ‘Bomb underneath a car’ in this article generally stands for indirect ways of telling outsiders they are unwelcome. I believe you are right. Things appear differently to insiders and outsiders. I merely described how the whole ‘Malta vs Gozo’ affair seems to an observer like myself. All these negative, stereotyped notions towards us Gozitans have now become cliches and outdated. Personally, I feel offended reading such articles. These prejudices are only harboured by Maltese people who hadn’t any contact with Gozitans in the last 20 years. It seems, many can only accept flatter, which is a pity. I do not claim this perception an absolute truth, however, most of it came from my observations and personal experience. Has there actually been bombs under someones car or? Well, from what I can tell “Paul” is a Gozitan and he just shared his views with you directly, rather than bombing you while you take a ride to buy groceries. Still, it’s an interesting view, and some does strike me as true, being a Maltese citizen who enjoys a yearly vacation once or twice in Gozo. I’m afraid most of this however, is a super anecdote, or your personal experience as a foreigner. I find Gozitans to be mostly friendly, well spoken and occasionally act silly or very serious. It really depends from person to person, I do honestly believe that at the core, we secretly adore each other, and only hate some individuals we had poor experiences with. The writer’s perceptions are pretty accurate. I always heard about different prices from my father and even experienced it first hand. Very interesting perspective. My wife and I spent five days on Gozo this year. As Americans, it never occurred to me that there might be this feeling of segregation between the people of Gozo and Malta. But now that I think about it, this goes on wherever one lives. Here in the U.S. it happens between the people of one state and another, between one county and another, and between one city and another. Unfortunately it’s too often human nature to look at the small ways we are different rather than focus on the many things we all have in common. This made me chuckle and miss Gozo. The segregation is simply a quirk. Talking about who has the better pastizzi gets old after a while. Making fun of each other keeps things exciting!